The quartzite on Slieve League splits into flagstones and was used for flooring or roof tiles. The mountain is noted for its spectacular array of cliffs descending straight from the summit to the sea, and for the dramatic One Man's Pass (Casán an Aonair). This narrow arete leading to the summit is not for the faint-hearted, especially on a windy day. All the same, it is a doddle beside the route taken in the 19th century by the botanist H.C. Hart, who traversed the cliffs of Slieve League at half-height, 1,000 ft. above the sea and 1,000 ft. below the summit. The entire journey, ending at Malin Beg, took him three days. At one point he was astonished to see footprints in front of him on this precipitous route. As he rounded the next eminence, he met an old man with his son, both eating samphire flowers. The old man was in a state of consternation to see a stranger there and pleaded with him to turn back, but Hart carried on. He reported that the route is known as Thone-na-Culliagh (prob. Tóin na Caillí). Robert Lloyd Praeger was very enthusiastic about the wide range of alpine plants on the north face above Lough Agh. There was a hermitage on Slieve League connected with St. Assicus of Elphin, Co. Roscommon. The ruins are the piles of stone still to be seen just NE of the One Man's Pass. Slieve League is the highest mountain in the Donegal SW area and the 296th highest in Ireland. 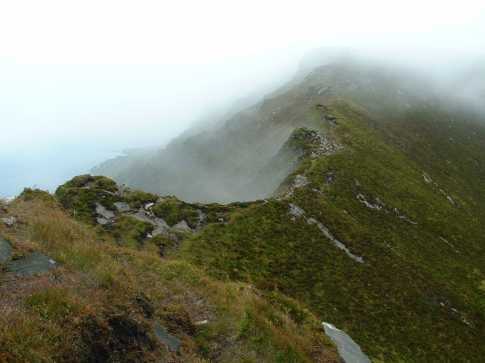 Slieve League is the second most westerly summit in the Donegal SW area.